The recently published study of AmCham “U.S. Investments in Bulgaria (1990 – 2016) clarifies to a high extent the structure, scale and importance of the American investments in our country. I would like to draw your attention to one of the sectors that has not been subject to separate focus in the study but is an important part of the overall U.S. investment, associated with major impact on human health, economic growth, innovative technologies and knowledge, and know-how. These are the R&D investments of major U.S. based innovative pharmaceutical and medical technology companies which are present in Bulgaria. Health is an essential human right and need. “More healthy nations” has been put as a priority of the EU and defined as one of the major factors and prerequisites of economic growth. There are enough reports and data of the significant decrease in mortality, due to certain socially significant diseases, as well as an increased life expectancy by 2-4 years that happened during the last 5 years. There are many reasons behind these positive trends, but a recent survey associate about 70% of this result with the higher investments in innovative medical and digital health technologies. Multinational clinical trials are the obligatory part of the innovative drug development and regulatory approval process. Bulgaria traditionally is one of the preferred destinations for performing R&D clinical trials by multinational pharmaceutical corporations, due to the highly qualified healthcare professionals with expertise according to the standard of Good Clinical Practice (GCP). This type of industry’s research and development (R&D) activities, such as clinical trials provide many tangible and intangible contributions to society and the economy. However, Bulgaria is still lagging in terms of the percentage of GDP invested in healthcare, which is only around 4.3-4.5% – one of the lowest in EU. These R&D clinical trials, performed by major U.S. and EU based innovative pharma companies, as part of their multinational clinical trial programs, are bringing direct investments in the Bulgarian healthcare system. Such investments save public drug expenditure, bring innovative medical equipment, educate healthcare professionals in the most recent advances in therapy, decreasing the number of medical doctors and nurses emigrating from the country, etc. Finally, Bulgarian patients are treated with the most advanced therapies in a highly controlled environment of these clinical trials, which provides them better opportunities for treatment success. Recent survey estimated the total R&D investment by multinational clinical trials in Bulgaria only for 20017 to exceed USD 170 million, US based pharma companies contributing substantially in this respect. I would also like to also mention the significant role that innovative industry in the healthcare sector plays in terms of educating young people from the early age and building the interest in life sciences, participating in educational projects in co-operation with high schools and universities. Last but not least, that industry supports the education of young medical professionals. 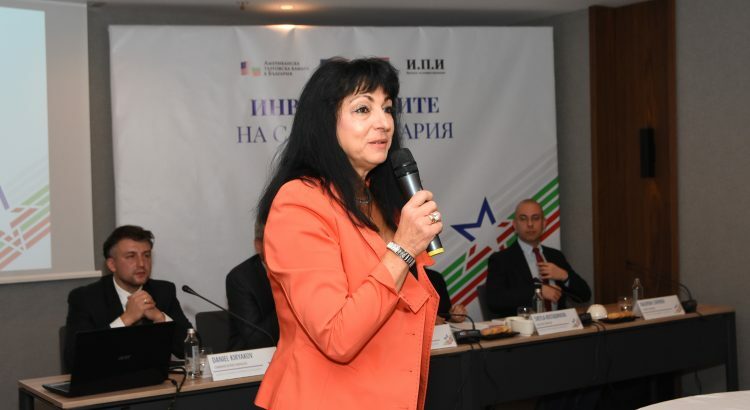 Statement by Ms. Krassimira Chemishanska, AmCham Bulgaria President and AmGen Bulgaria Country Manager, during the AmCham Media Breakfast, October 9th, 2018.